This is the perfect tooth brushing activity for preschoolers! It is a hands on activity that involves children cleaning marks of huge teeth with a toothbrush! It will help encourage healthy tooth brushing habits while being fun for them. Dental activities for preschoolers are great as children begin to learn about correct dental hygiene. We've included a free dental health printable to help you prepare this activity. Just follow the steps below to get started with your own tooth brushing activity. 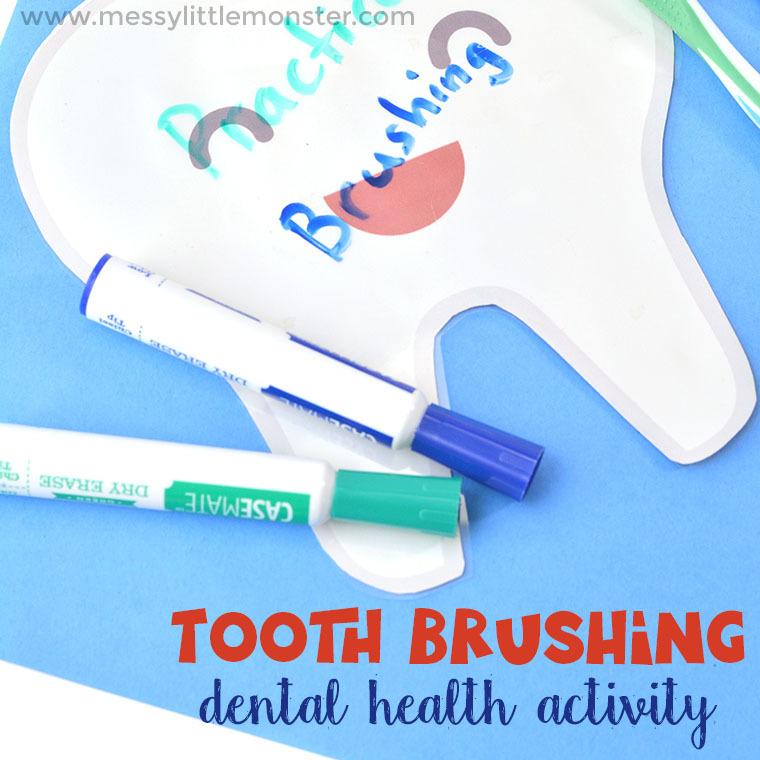 Looking for more fun to go along with your tooth brushing activity? Check out this fun sing along! 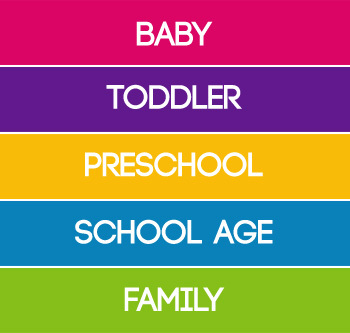 It's a great addition to dental activities for preschoolers. 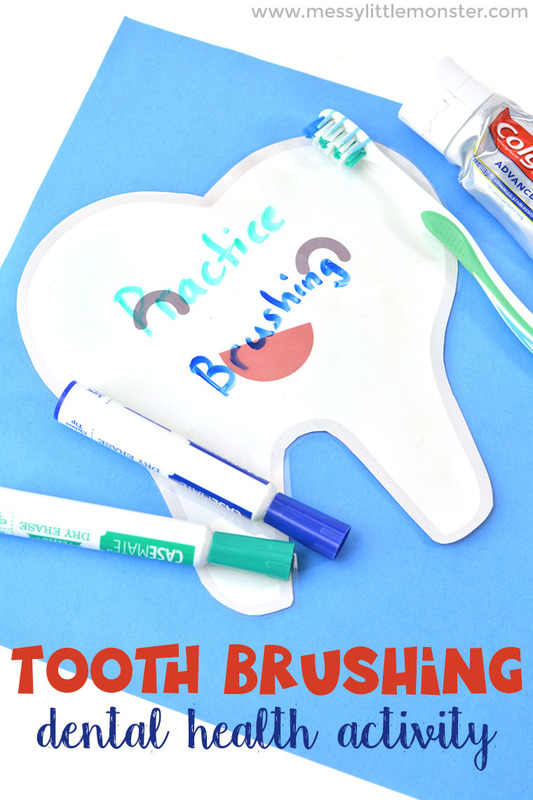 Below you will find easy step by step directions to make your own tooth brushing activity! Preschoolers will love getting involved in this hands on activity as they learn all about the importance of tooth brushing. Before the fun can begin you will need to prepare this tooth brushing activity for preschoolers! Be sure you download and print out the dental health printable. You can find the free download by scrolling down below. Cut out the large tooth shape and laminate it. 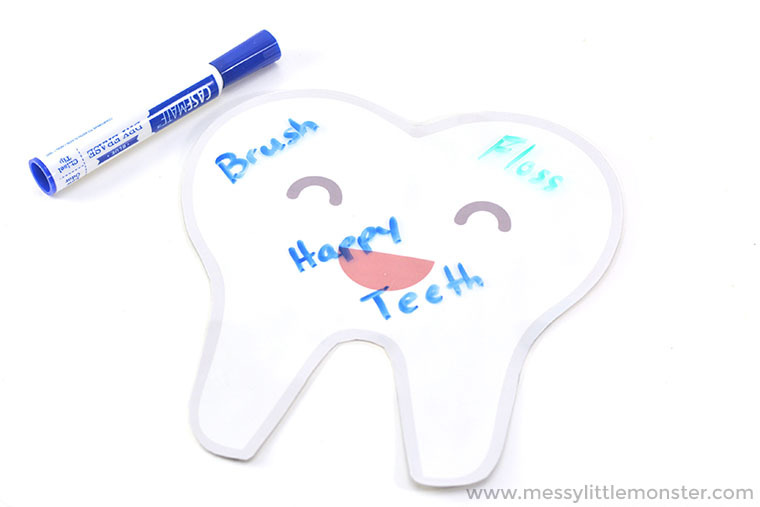 Draw on the tooth with dry erase markers. 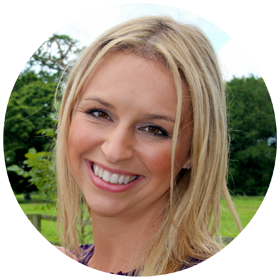 You could write works related to dental health or your may prefer to let your preschoolers make their own marks! STEP 3: Brush your teeth! Invite the preschoolers to have fun with this tooth brushing activity by handing them an old toothbrush to scrub away at the writing. This sensory activity is a great introduction to the importance of dental health and great for practicing teeth brushing! To download this dental health printable activity for free add $0 and click on the 'I want this' box below. It may take a moment for the page to load so please be patient. 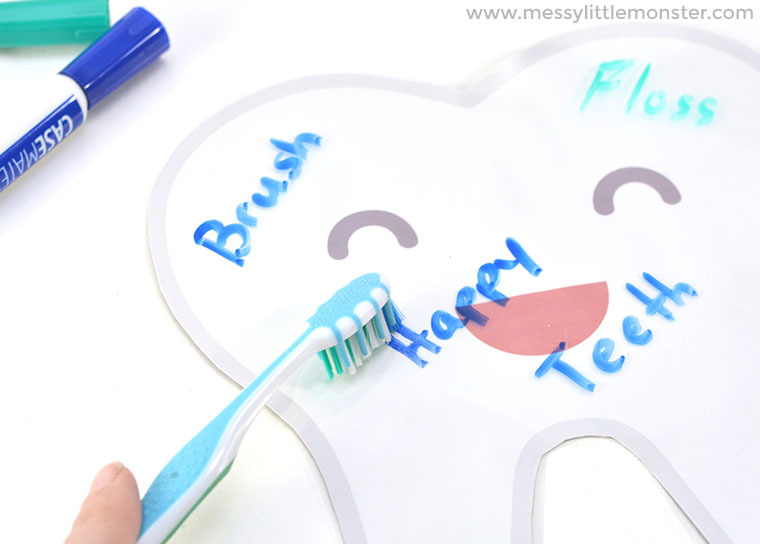 Your will have so much fun with this tooth brushing activity for preschoolers! They'll love helping to make marks on the teeth and have even more fun helping scrub the teeth clean with a toothbrush. This tooth brushing dental health activity is a great way to help encourage healthy tooth brushing habits! Be sure to check out the tooth fairy printables for even more fun.